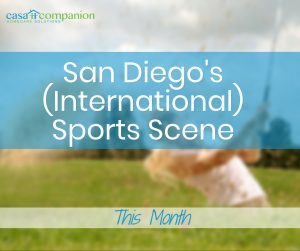 San Diego hosts some of the sports world’s premier events this month in Carlsbad, in Del Mar and in Oceanside. Whether you love the ocean, animal athletes or the links the best, you can watch the best pros in the country and the world right here at home. Caregivers, home care aides and loved ones can all find someone or some horse to root for this month in San Diego. Did you know that our very own Carlsbad hosts one of the top events on the women’s golf tour? The Kia Classic takes over the Park Hyatt Aviara Golf Club between Poinsettia and El Camino Real every year for a long weekend in March. The $1.8 million purse for the winner is the second highest among California women’s tournaments, and 2018 is only its 9th The women of the LPGA fierce competitors, and there will be plenty of seating and exciting golf to watch! This weekend, Oceanside hosts the Western Surfing Association Surfing Competition at the South Harbor Jetty. Competitors can choose among 26 divisions for boys, girls, men, women, Master’s, Seniors, Legends, long board and adaptive standing or other. Winners here will move up to the West Coast Championships, Prime Events, the U.S. Championships and any World Team Event. Watch these fearless kids and skilled adults take on the ocean to find the perfect wave, and each other for the perfect score! The Del Mar National Horse Show at the Del Mar Fairgrounds is a three-week celebration of equine athletics and showmanship. Each week, a different riding style and discipline will be on display: Western Week is April 17 – 21, Dressage Week is April 26 – 29, and Hunter/Jumper Week is May 1 – 6. Special events include The Night of the Horse, Evening of Musical Freestyles featuring local dressage riders Steffen Peters and Guenter Seidel, and the $100,000 Grand Prix of Del Mar for the hunter / jumpers. Tickets: [https://delmarnational.com/tickets/]: Admission to the fairgrounds for the daytime competitions are free, but the special events, Grandstand and dinner box seats are extra. Caregivers, home care aides and loved ones have a chance to see some of the best athletes in the world compete this month, close to home. Family, friends and fanatics can all find something to watch and someone to admire when San Diego’s sports scene takes the world stage.